Drain, wash and re-drain the garbanzo beans. Place all the above ingredients into a food processor. 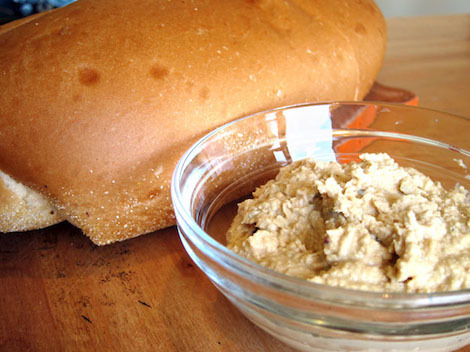 Turn on for 1 to 2 minutes adding water in small quantities until the hummus flows smoothly (about 2-3 ounces). Turn off the food processor, scrap the edges and let it run for a 30 seconds to a minutes. Let sit for about a day to set. When Chris Blair reflects his his favorite family recipes from childhood he realizes the list is so short that the foods he has come to truly appreciate he acquired as an adult. He's gained inspiration from trying different things and eating at other people's tables. The Hummus at Home and the Coarse Simple Salsa (the recipe is also posted on Heirloom Meals' website) are two things he makes regularly. He began making the Hummus at Home because he is not to fond of the hummus in a bucket. A RoboCoupe or Cuisinart are the best food processors to use. This recipe may be halved directly for a smaller portion. I have made this recipe with different garbanzo beans including cooked from dried beans. I don’t believe using dried beans is better. There is a wide difference in canned beans: some contain more water or less fiber and some less water or more fiber. Recently the more expensive seemed to have less water or more fiber.